Islamists seem to be driven not only to establish the hegemony of Islam by supplanting secular governments and legal systems, but also by enforcing religious purity according to their own standards. Muslims in America – most of whom were undoubtedly fleeing abuse, not trying to bring it with them – should of course be treated with the same respect and deference extended to people of other religions But our civility should not blind us to the potential for extremism – a concern shared by 60% of Muslim Americans – or to the religious connections between Islam and terrorism. An excursion into the blogosphere reveals the polarization which attends Islamic issues. Comment areas are populated with readers who seem to think that Islam is a monolithic belief system. This myth, maintained by both "Islamophiles" and "Islamophobes," has overshadowed any nuanced discussion of Islam. By seeing Islam through this lens, American idealists and their European counterparts are projecting Western democratic values upon the Islamic world in the sincere belief that in the end, reason and human goodness will triumph. As many of these values, discussed in detail below, are at the core of America's identity, errors in judgment can have grave consequences for American foreign policy, domestic security, and even our constitution. There is a popular belief, especially in America, that all people, deep down, want democracy, individual liberty, toleration, peace, and equality under the law. While undoubtedly true of many, this modern ideal assumes that everyone is the same; that anyone who is educated in the ways of Western democratic ideals will embrace them if given a chance, and that inequalities in the world are the product of bad governments, not bad people. The reconstruction of Germany and Japan after WWII, and the successful adoption of democracy by those countries, appeared to validate this notion and emboldened the U.S. to employ the same nation-building strategy in the middle east. Among these Muslim nations, however, universal democracy has proven to be an illusion leading to a over a half century of misguided foreign policy that has repeatedly failed. In what can only be characterized as an embarrassing display of ignorance, the U.S. has consistently underestimated the depth and determination of Islam's political ideology. Nazism, Japanese imperialism, and Soviet-brand communism were a mere flash-in-the-pan compared to Islamic supremacism, the roots of which go back fourteen centuries. Islamism looks here to stay. Globally, the story is the same. Out of the 57 nations which comprise the Organization of Islamic Cooperation, only three rise to the level of flawed democracies, according to the 2010 Democracy Index by The Economist. With the exception of communist and former communist countries, Islamic nations impose the highest level of government restrictions on religion. Among the predominantly Islamic countries in the middle east and North Africa, 80% have anti-blasphemy laws and 60% of these nations enforce them. Democracy, individual liberty, free speech, toleration, and equality are simply not consistent – or even compatible – with traditional Islamic theology and Shariah law. The very concept of religion in traditional Islam differs considerably from Christianity, Judaism, and most other world religions. Since the time of the Enlightenment and the rise of secular governments, Americans and Europeans have looked upon religion primarily as a personal affair of the heart. They want to live in a tolerant society that reflects their common values, and where they are free to practice their religion without compulsion or hostility. But Islamism is not just a religion; it is also a totalitarian ideology. It regulates not only religious practice, but also civil law, public speech, dress, diet, marriage, family, economics, education, property, defense, and so one – and, most totalitarian of all, those who choose to leave Islam are often threatened with death. Unlike Christianity, which recognizes the divine legitimacy of secular government (see Paul's letter to the Romans 13:1-7), Islamism recognizes only one legitimate form of government: Theocracy. The imam is effectively, if not actually, the head of state. Islamists cannot co-exist indefinitely with other religions in a pluralistic society as simply one of many. As Muslims have become more numerous in Western countries, especially in France, Germany, Belgium, and the United Kingdom, their strict adherents agitate for greater social control, often at the expense of the individual liberties of others. Criticism of their religion, their prophet, or their holy book is often met with threats, intimidation, and sometimes violence. This is especially true in the hundreds of so-called "no-go zones" throughout Europe – Muslim-controlled areas that are off limits to non-Muslim citizens and even law enforcement officers. Islamists in America and Europe have already succeeded in eroding the rights of free speech, and seem to be working to erode it even further. These include the right of Christians to proclaim their faith to Muslims, the right of non-Muslims to wear religious jewelry and clothing, and the right of Muslims to leave their own faith (under Shariah law apostasy is punishable by death). Those who dare practice their First Amendment rights of free speech in America by questioning Muhammad or the Quran, are branded "Islamophobes" or "racists," or even place their lives at risk. Offensive speech in America is sometimes punished by injuring or killing Americans abroad. A 13 minute YouTube video provoked a long succession of violent protests against Americans by Muslims throughout the world. These threats and violent responses have created a chilling effect on the exercise of free speech. Islamic supremacists have come to realize that they do not have to change the First Amendment to suppress criticism of their faith, they only have to render it ineffective. Over the past few years there have been several highly publicized instances of self-censorship by the American media. Even academic inquiries, once a stronghold of free speech, operate under the fear of Islamic reprisals. In 2009 Yale University Press refused to reprint any cartoons of Muhammad in a book by Jytte Klarsen about these cartoons. A similar incident took place recently in the United Kingdom when a British television station decided to cancel the screening of a controversial documentary on Islam by a British writer and historian. National Geographic, as well, was forced to increase security at its headquarters after threats were made over its upcoming documentary, "SEAL Team Six: The Raid on Osama Bin Laden." In Europe and Canada, hate-speech laws are invoked against those who are perceived to have offended Muslims or their religion. Proving such accusations can result in lengthy and expensive court trials for defendants. Dutch Parliamentarian, Gert Wilders, endured three years of litigation in Dutch courts before he was finally exonerated.And at the United Nations, the Organization of Islamic Cooperation (OIC) has promoted "defamation of religion" resolutions that would criminalize speech deemed offensive to Islam. A watered down version of these resolutions, ostensibly to combat religious "intolerance," has been passed by the U.N. Human Rights Council, but the OIC has made it clear that their ultimate goal is to criminalize any criticism of the Quran or Muhammad. Islamic supremacism is tooled for a multi-generational struggle with the West, a "Civilization-Jihadist Process" which, as the Shura Council of the Muslim Brotherhood explains, "is a kind of grand Jihad in eliminating and destroying the Western civilization from within." Many Muslim leaders who live in the United States refuse to accept the separation of mosque and state. Organizations such as CAIR (Council on American Islamic Relations), the Muslim Brotherhood, and the AMJA (Assembly of Muslim Jurists in America) are resolved to bring American law into compliance with Shariah law, at the expense of the U.S. Constitution. Attempts to soft-pedal Shariah law are pervasive among Islamist attorneys who dissemble to avoid revealing both Shariah law's inequities and its incompatibility with universal human rights. Currently, the Center for Security Policy has tracked some 50 U.S. court cases involving "conflict of law" between Shariah and American state law. According to the Center, this is only a sample of the total number of possible cases. The report concludes "that Shariah law has entered into state court decisions, in conflict with the Constitution and state public policy." In Britain, at least 85 Shariah courts are already in operation. U.S. legislation designed to further or prevent accommodation to foreign laws (including Shariah) by American courts has been passed in several states without a constitutional challenge. ALAC, American Law for American Courts, is vehemently opposed by CAIR as unconstitutional and anti-Islamic. CAIR's resistance is itself an indication that its members are reluctant or unwilling to accept the authority of American law. With regard to human rights, the American founding fathers rightly believed that equality, free speech, and religious freedom, are universal and inalienable. Such rights are granted by God, not by government. Consequently they cannot be abridged or revoked by government. This view is rejected by Islamists. In defiance of the U.N.'s 1948 Universal Declaration of Human Rights, Islamists recognize only those rights which are narrowly granted under Shariah law by the Quran and the Hadith (the traditional account of the life and sayings of Mohammed, written many years after his death.). This alternative view of human rights was clearly set forth in the 1990 Cairo Declaration, endorsed by all 57 member Organization of Islamic Cooperation. In Shariah compliant cultures, such as Saudi Arabia and Iran, inequalities between men and women, or Muslims and non-Muslims, are the rule rather than the exception. Women, Christians, Jews, polytheists and especially atheists are regarded as socially, legally, and even mentally inferior to Muslim men. While Christianity and Judaism teach that all people should be treated with kindness and respect because they are created in God's image (see Matthew 5:43-44, 1 John 4:20), the Quran forbids friendship with unbelievers (Quran 5:51) and considers it unlawful even to give them charity (zakat). Non-Muslims are forced to embrace Islam or be reduced to dhimmis – second-class citizens. Under Shariah law, dhimmitude is a form of subjugation, which limits the social, religious, legal, and economic rights of non-believers, and imposes a special tax burden on them as a penalty for rejecting Islam. As religious freedom in America hinges on the First Amendment, by effectively eliminating dissent, Islamists hope to propagate their ideology without being inconvenienced by a vocal opposition. Historically, the control of information – using government power to silence "offensive" speech – is one of the first steps in establishing a dictatorial or totalitarian rule. After a recent chain of violent protests overseas against a YouTube video, "The Innocence of Muslims," the imam of Michigan's largest Islamic center in Dearborn, Michigan, condemned the violence but also urged the American government to stop the producers and promoters of the U.S. made video. "Somehow, they should be stopped," said Hassan Al-Qazwini. "The U.S. response should be much more stronger than verbal condemnation." Mohammad Qatanani, one of the most prominent imams in North America, suggested that limiting free speech is a matter of national security and called upon the Department of Homeland Security to suppress all speech critical of Islam. Recent First Amendment lawsuits against heavy-handed Islamist tactics may signal the beginning of an alarming trend already underway in Europe. In the instance of Florida Pastor Terry Jones, who gained notoriety for burning copies of the Quran, both the city of Dearborn, which is over 40% Muslim, and the Dearborn District Court, were complicit in systematically denying Pastor Jones's constitutional right to protest Islamic beliefs and practices (Jihad, Sharia Law, the radicalization of American Muslims) on public property in front of Dearborn's Islamic center. The Wayne County Circuit court finally decided in favor of Jones, despite the offensive content of his speech. At the international level, the religious liberties Muslims enjoy here in America are also not currently being reciprocated by most Islamic nations. Instead, Christianity and Judaism are suppressed; Christians and Jews are sometimes harassed, persecuted, jailed, and even killed. The Saudis, for example, are permitted to fund the building of U.S. mosques and Islamic centers, and to supply anti-Semitic and supremacist-based curriculum material to American Muslim schools. In Saudi Arabia, however, it is illegal to build a church or even gather as Christians to worship. A recent declaration from a Saudi cleric called for the destruction of all churches on the Arabian peninsula. Even though, out of roughly 1.5 billion Muslims, Islamist radicals are but a tiny minority, many Americans would like to believe that there are vast numbers of moderate Muslims in the world who will rein in the small factions of radical Islamists. Although there are few Muslims who are willing to strap a bomb around their waist, extremists nevertheless enjoy an extensive base of moral and material support. Countless international polls show that approval for Islamic violence is widespread. A 2011 Pew global research poll revealed that even though support for al Qaeda is declining, support for the terrorist groups Hamas and Hezbollah is still strong in Islamic countries—42% - 61% in Jordan, Egypt and Palestinian territories; 33% - 38% in Lebanon and Indonesia, and 5% - 14% in Turkey and Pakistan. Among these same countries, support for suicide bombings against civilians ranged from 4% to 68%—averaging 23.5% for all seven nations. These percentages add up to tens of millions of potential aides and sponsors of terrorism from these countries alone. Globally, the number could be in the hundreds of millions. Support for terrorism does not stop at U.S. shores. A recent study published in the Middle East Quarterly concluded that of 100 U.S. mosques surveyed, a total of 81% had literature that either directly advocated violence (51%), or supported violence (30%), in the interest of spreading Islam and implementing Shariah law. Also, although Muslim-Americans are apparently more culturally assimilated than their community and religious leaders or their European counterparts, a 2011 Pew research poll found that a total of 13% of Muslim-Americans believe that suicide bombings against civilians can be justified—5% rarely, 7% sometimes, and 1% often. With an estimated American Muslim population of 2.75 million, this translates to 220,000 Muslims (8%) who sometimes or often support suicide bombings. Vigorous efforts are underway to recruit these as potential terrorists from the fringes of the Muslim community. In view of the 9/11 attacks and the Fort Hood shooting, their possible impact could be much larger than their small numbers suggest. Moderate Muslims will also not rein in radical Islamists as extremists are the ones who drive the train. In many Muslim countries the majority does not rule. Instead, a fervent minority imposes its agenda on large populations through persuasion, or, failing that, through intimidation – often justified by appeals to Islamic tenets. This model was developed in the seventh century by Muhammad and the first generation of Muslims: a relatively small band of followers conquered and converted the entire Arabian peninsula by the sword in fewer than 30 years, during which thousands of Arabs and Jews were slaughtered. The promise of democracy, heralded by the so-called Arab spring, is already being extinguished by the sword of Muslim supremacism. If there is a large majority of moderate Muslims, they are either unable or unwilling to resist the advance of Islamists. To put this "tiny minority" of extremists in perspective, consider the numbers. 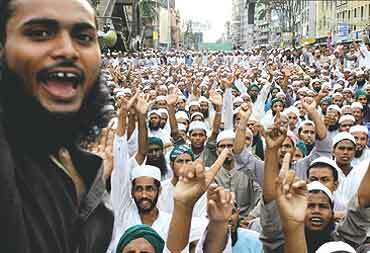 Muslim world population is approaching two billion. Even a "tiny minority," say 1%, would number 20 million (not to mention the tens of millions of willing adherents). Though scattered throughout the world, this is an army sufficient to destabilize governments, subvert cultures, and terrorize millions of innocent people. There have been, since 9/11, tens of thousands of documented terrorist attacks carried out by this "tiny minority" of Islamic supremacists. In discussing Islam, most Muslims in America, which values free speech and religious tolerance, feel free to speak candidly about their beliefs. But in other countries where Muslim supremacists are still a small minority, they are empowered by Shariah law to propagate their faith by whatever means they can, including, stealth and deception. This practice, which is known as taqiyyah (dissimulation), or kitman (concealment), is deeply embedded in the history of Islam, and forms an essential first step in jihad—the holy war on unbelievers. Yet, many in the Western press continue to take the words of Islamic leaders at face value without adequate scrutiny. Consider recently elected Egyptian president, Mohamed Morsi. When addressing his followers he promises to establish a strict Islamic state and renew hostilities with Israel. But when addressing the nation he talks about democracy, inclusion, and honoring international treaties. In Germany, attempts by Salafists to spread the Islamic faith through a program known as "A Quran in Every Home," involve the distribution of edited copies of the Quran in which Surahs (verses) which contain disparaging remarks about unbelievers and advocate war against infidels were conveniently omitted. Islamists often refrain from discussing the unsavory aspects of their faith such as the degradation of women, the suppression of free speech, the killing of apostates, the death penalty for adultery, homosexuality and "blasphemy," and amputation for crimes of theft. Some even deny that such problems exist. A number of major Muslim organizations in America with clouded histories have had and may still have, affiliations, clandestine or otherwise, with international Islamist groups such as the Muslim Brotherhood and Hamas. Imam Feisal Abdul Rauf, who was spearheading the so-called Ground Zero mosque, condemns terrorism, but then equivocates when pressed to denounce specific terrorist organizations such as Hamas. The AMJA, a high profile association of Muslim attorneys, instructs its members to engage in legal deception in order to eventually supplant U.S. laws with Shariah. CAIR, which presents itself as the face of moderate American Islam, was named as an unindicted co-conspirator for funding Hamas terrorists in the 2007 Holy Land Foundation trial. The FBI severed its relationship with CAIR shortly after. These Islamic organizations all appear to engage in concealment, lies and half-truths, possibly to propagate subversive agendas. There are many Muslims throughout the world who would prefer to live in peace and have no desire to spread Islam by force. Some have fled to the U.S. and Europe to escape the violence and oppression imposed in their native countries by Islamists and Shariah law. Historically, however, Islam has always been a religion at war with the world and even with itself. As traditional Islamic teaching attests, there are only two abodes in the world: Dar al Islam—the Abode of Islam, where the edicts of the Muslim faith are fully promulgated; and, Dar al Harb—the Abode of War, where infidels have not yet been subdued by Islam. For the believer, this distinction leaves one either inside Islam, or at war with non-Muslims, to bring them under Islamic rule. Shortly after the 9/11 attacks of 2001, President George Bush announced to the world that the United States was not at war with Islam as it is a "religion of peace," and his successor, President Barack Obama, has continued to advance this policy. Driven either by a sincere belief in that definition, the fear of being accused of "racism" and "Islamaphobia," or possibly deferring to a bloc of well-funded special interests, the U.S. government has pursued a politically correct doctrine which willfully turns a blind eye to any connection between terrorism and Islam, as for example, in labeling of the 2009 Fort Hood shooting by Major Nidal Hasan as "workplace violence." Hasan not only came under the influence of radical Islamic teaching, but had "S.O.A.," Soldier of Allah, printed on his business cards, and according to witnesses shouted "Allahu Akbar" ("Allah is Greater!") as he gunned down 13 people. A religious war with those who are unbelievers in the mission of Muhammad. It is an incumbent religious duty, established in the Qur'an and in the Traditions as a divine institution, and enjoined specially for the purpose of advancing Islam and of repelling evil from Muslims…[Quoting from the Hanafi school, Hedaya, 2:140, 141. ], "The destruction of the sword is incurred by infidels, although they be not the first aggressors, as appears from various passages in the traditions which are generally received to this effect." If infidels refuse the call to Islam and do not agree to pay the dhimmi tax, called jizya, in recognition of their subservience, Muslims are required to make war upon them, "set fire to their habitations…inundate them with water and tear up their plantations and tread down their grain," to weaken their resolve. Muslims are directed to engage in a perpetual holy war against unbelievers until they submit to Islamic rule. This longstanding historical interpretation is fully supported by modern Islamists and serves as the propelling force behind their aggression. When Islamists call their religion "a religion of peace," they mean something quite different than the commonly received Western understanding of "peace" or harmony among people of differing loyalties. Saudi Shaykh Muhammad Saalih al-Munajjid explains in his fatwa (religious ruling), "Yes, it is the religion of peace but in the sense of saving all of mankind from worshipping anything other than Allaah and submitting all of mankind to the rule of Allaah." In other words, once the world submits to Islam, there will be peace—pax Islama. When one hears that Islamic terrorism is a reaction to Western political and economic oppression, and American foreign policy, the assertion seems reasonable enough to merit credibility. American and European foreign policy—support for Israel, meddling in middle east politics, infidel feet on Islamic soil, and the invasion of Iraq and Afghanistan—have put the U.S. in the cross-hairs of Islamists and have likely stepped-up the frequency of terror attacks on Western targets. These circumstances, while possibly even true, serve as a justification, or rationalization, for aggression and are often used to evoke sympathy for terrorist acts against innocent civilians of all faiths (including other Muslims) by turning the criminals into victims. Unfortunately, however, there is nothing the West can actually do to achieve peace with Islamic extremists, short of becoming Muslim or paying the dhimmi tax under Islamic subjugation. Islamists use the United States, the "Great Satan," as a foil for their hatred of "decadent" Western civilization and Christianity; and they use Israel, the "Little Satan," as a foil for their hatred of Jews, who, according to the Quran (5:60), were cursed by Allah and turned into apes and pigs. The stated goal of Islamic extremists is not simply to free Arab lands from Western interference and to annihilate Israel, but to consolidate the global "Ummah" (Islamic nation), and establish a Muslim empire ruled by a universal Caliph. While this may seem rather improbable, if not unbelievable, to Westerners, the Muslim Brotherhood, al-Qaeda, Hamas, and the Mujahideen regard the restoration of the Caliphate as one of their main objectives. These organizations have outspokenly devoted themselves to a violent, never-ending struggle to bring about this end. In the well-known words of the Muslim Brotherhood's creed, "Allah is our objective; the Quran is our law, the Prophet is our leader; Jihad is our way; and death for the sake of Allah is the highest of our aspirations." Another cause of terrorism among Muslim factions is internal strife. Islamists seem to be driven not only to establish the hegemony of Islam by supplanting secular governments and legal systems, but also by enforcing religious purity according to their own standards. Violence between Sunni and Shiite extremists has been ongoing in Muslim countries for over a millennium. Wahhabi and Salafist purists export violence and terrorism to Islamic states and Muslim communities around the world, while imposing a strict compliance with Shariah law on other Muslims. Over the past five years, 82% - 97% of terrorism victims worldwide have been Muslims. Most of these casualties were the result of Islamic factional violence. Last year, the greatest number of major terrorist attacks (that is, involving 10 or more deaths) took place in Muslim-majority countries. Most of the violence carried out by Islamic supremacists has no direct connection to Israel or the U.S., and little or nothing to do with economic and political oppression. If both Israel and the U.S. were to disappear today, Boko Haram (the name means, "Western Education is Forbidden") terrorists would continue to slaughter Muslims and Christians in Nigeria and burn churches to the ground. Islamists in India, Pakistan, and Bangladesh would still persecute and kill Hindus, as they have for centuries. The Janjaweed Islamic militia would carry on its genocidal slaughter against Christians in Sudan. Iraq's Shiite, Sunni and Kurdish factions would persist in their violent struggle for power. The persecution of Coptic Christians in Egypt would press ahead uninhibited. Oppression and violence against Muslim women under Shariah law would most likely increase. The Taliban in Afghanistan would keep on poisoning and shooting Muslim girls for attending school and affirming their right to be educated. The cadence of misery inflicted upon the world by Islamic extremists would not miss a beat. As Robert Durie Osborn, a British major who served in India during the nineteenth century, put it: "They are strong only for destruction. When that work is over, they either prey upon each other, or beat themselves to death against the bars of their prison-house." Islamic supremacism likely poses a multi-generational threat to the existence of Western civilization—perhaps the greatest threat it has ever faced. As members of American society, Muslims – most of whom were undoubtedly fleeing abuse, not trying bringing it with them – should of course be treated with respect, and their religion afforded the same deference we extend to other religions. But our civility should not blind us to the potential for extremism in the Muslim community – a concern shared by 60% of Muslim Americans – or to the religious connections between Islam and terrorism. Considering the magnitude of the threat, we can no longer afford to entertain the naïve and dangerous premise that argues that all religions are essentially the same: Islam is different.